Launched in 2009, the media company now includes a popular weekly news roundup, TZLR News, and, soon, a talk show, That's My Word. Dustin “Nump’ Perfetto before going live at TZLR News studio in Fruitvale. Nump bounded into the office of Matt Werner, founder of prominent Bay Area hip-hop website Thizzler, with a joint dangling from his mouth, ready to report the news. On Werner's desk was a plaque from YouTube marking 100,000 subscribers. It was old; Thizzler's channel recently surpassed 500,000. The site was redesigned late last year, foregrounding its expanded slate of original content, and one of Thizzler's best and most popular new features is TZLR News, a weekly rundown of the latest feuds and coups in local rap — hosted, with lots of verve, by the wild-eyed firecracker known as Nump. 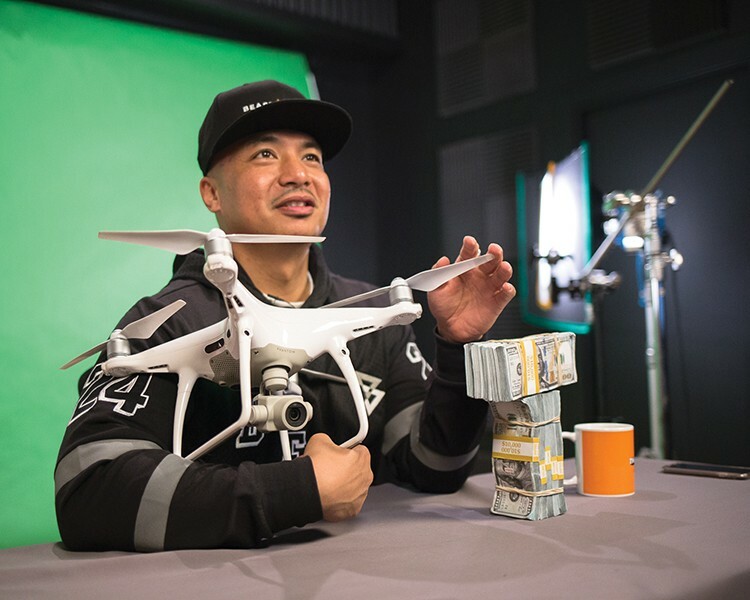 Thizzler, which Werner launched out of his bedroom in 2009, boasts a staff of seven and a modest Jingletown headquarters with a large video-production suite. Surprisingly for such a large market, it's practically the only daily source of local hip-hop news (aside from radio). And the site's clout is such that when Bay Area ambassador E-40 came by to record a tender acceptance speech after receiving a lifetime achievement award as part of Thizzler's year-end package, he stayed for four hours to talk shop. The site runs blurbs beneath the streaming widgets that anchor its posts, but Thizzler's voice — boosterish and exuberant, suffuse with regional references — comes through more in video content. And TZLR News, which Werner said averages 20,000 views per episode, is just the start: This month, Thizzler launches That's My Word, a talk-show — helmed by local artist Qing Qi as well as Leon "D-Nas" Sykes II, the outspoken lifeguard and former host of Streets Is Talkin on Youth Radio — that Werner described as the opinionated foil to TZLR News. "Our overall goal for the video studio is make it a complete press run," Werner said. "Have an artist with a new release do an interview, do a first listen, do That's My Word — several pieces of content for release across a couple of months." Like Mac Dre's satirical impersonations of establishment figures (e.g., Ronald Dregan), TZLR News winkingly appropriates the tropes of network news programs: orchestral theme music, deskbound coffee mug, and plenty of superimpositions on the green-screen behind Nump. The news items are culled from a rolling group-text, and then Austin Adams, the show's A&R, works them into a loose script. Nump, a longtime local artist and sound engineer with close ties to the cannabis industry, inflects even innocuous items (say, a rapper appearing in a Sprite commercial), with life-or-death gusto and ample puns. Nump and four of the show's producers and assistants gathered in the studio during my recent visit to debate the first of many subtle decisions in the course of the afternoon: to smoke before or after? (Before.) Outside under an awning, Nump, whose Filipino heritage figures prominently in his banter, pondered the difference between gumbo and adobo and their respective usefulness as metaphors for eclecticism. What to give away today? "I got tickets to The Pack," Adams said. Nump, incredulous: "You bought those?" Inside, Nump said, "Show me the meme." He reviewed a seconds-long viral clip of Likybo gesturing nonchalantly with his hands and then imitated it, improvising a bit about how artists ceaselessly prod him to post their work on Thizzler. "What's a word for hot fire?" he asked before the next segment. "Smoldering," a writer ventured, reminding Nump instead of "smores," which appeared in his next ad-lib. Anticipating Nump's jokes was like a game, with everyone smiling at the arrival of each top-of-the-head zinger.